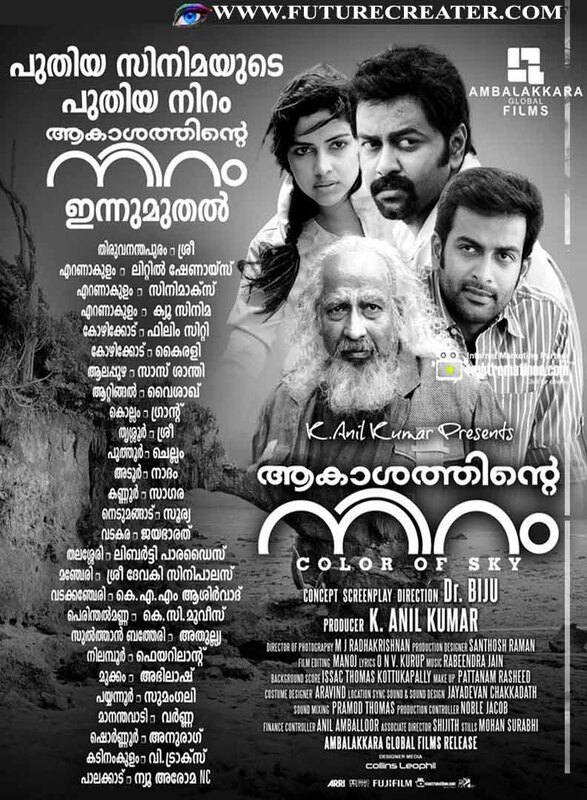 Akasathinte Niram (Malayalam: ആകാശത്തിന്റെ നിറം; English: Colour of the Sky; French: La couleur du ciel; German: Die Farbe des Himmels) is a 2012 Malayalam film directed by Dr.Biju starring Indrajith and Amala Paul in the lead roles. A 60-year-old man lives on an isolated island. He visits the nearby harbour in a motor boat once a month to sell handicrafts. A young burglar keeps tabs on him and one day jumps onto the motor boat and demands money. The old man remains calm and takes the motor boat towards his island where the young man remains trapped. He meets the people who live with the old man, a 7-year-old boy, a 20-year-old deaf and dumb lady and a middle-aged man with a stammer. The intruder confronts rare life situations for the first time, His concept about life changes as he understands how nature blends with life. The film is the ‘colour’ of life, of the wind, of the sea and nature. § Master Govardhan as Boy. The film produced by K.Anilkumar under the banner Ambalakkara Global Films. It won 3 Awards includes Best Camera work (M.J Radhakrishnan) , Best Processing Lab (Gemini Color Lab) And Special Jury Award for Direction (Dr.Biju) in Kerala State Film Awards-2011. The world premiere of the film was at Shanghai international film festival June 2012. The film entirely shot at a tiny beautiful island "Neil", located 40 Kilometers to the south of the Andaman and Nicobar Islands situated in the Bay of Bengal. A beautiful wooden shore house was set for the film.